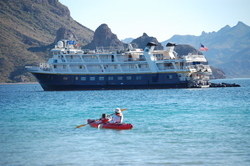 Our family took a short cruise up the Sea of Cortez in Mexico in January, just before school resumed. It was a wonderful nature cruise that offered up-close glimpses of wildlife, hiking, snorkeling, and sea kayaking. I'm not a person who enjoys water. I can tread water, but going out in deep water causes me to panic, due to some early childhood trauma involving my dad throwing me in a lake in an attempt to teach me using the old "sink or swim method." I sank. Like a rock wearing a toolbelt. I don't like inhaling saltwater, so snorkeling has never held much appeal to me either. Frank and Alex, on the other hand, are like a couple of friendly, inquisitive sea mammals and would rather snorkel than walk on land any day. I was feeling a little left behind sitting on the beach with my People magazine, and so when the opportunity to kayak came along, I decided to "feel the fear and do it anyway." I trusted that my husband would save me if we tipped over, and felt pretty sure that I wouldn't drown with the industrial-strength inflatable life vest I had strapped on my chest. Neither Frank or I had ever been sea kayaking before this trip. Alex was happily building sandcastles with a half dozen or so other kids from our boat, and one of the other moms agreed to keep an eye on him. So, we squeezed ourselves into a 2-person kayak and paddled out to sea. We made it out of the protected lagoon with ease, gliding on top of the water as sea birds swooped down to feed on fish swimming near the surface. It was beautiful and calm, with a light breeze making ripples in the water. We could see other kayakers out in ocean, paddling along with no problem. There was something very serene about gliding along on top of the azur water, surrounding by ocean and craggy mountain peaks. 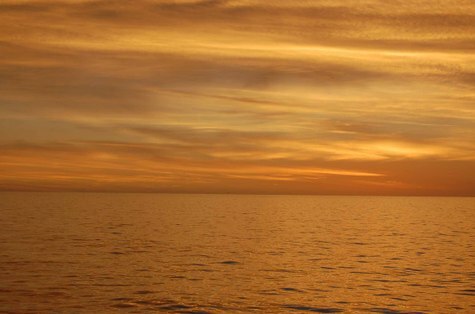 Though we could see other people in the distance, the two of us were alone in our little boat, calmly paddling out to sea to face the unknown. On the third day of our cruise to Baja, I got up early to see the sunrise. The cruise expedition leader, Larry, announced it over the ship's intercom. By the time I got up, there was already a small crowd gathered on the upper deck, staring intently into the eastern sky. Some were wearing bathrobes and holding steaming cups of coffee, and others had thrown coats over t-shirts and sweats. 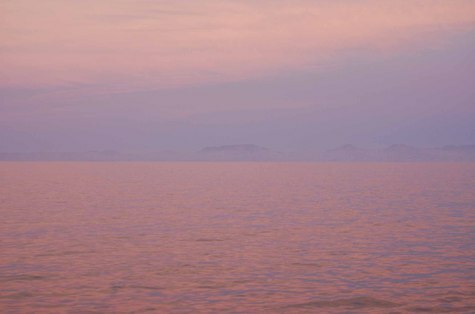 Looking away from the rising sun, the misty sea was a pale pink, baby blue, and lavendar color, a Monet sunrise. Larry explained this was called "the vermillion sea" by sailors. It was all very beautiful, poetic, and profound. After the first evening in Mexico, the wind was fairly high, so we didn’t actually leave the dock until Thursday morning, January 3. I woke up when the boat started rolling, probably around 5 am. It was a pretty gentle roll at first, and Frank and Alex didn’t even wake up. Around 6:30, the rolling became much more volatile, and it was hard to make even one step into the tiny bathroom without having to grab for something to hang onto. I thought it was a little odd to be on a cruise that didn't leave the dock, but after that early morning experience, I was glad we stayed in the shelter of the harbor. Alex slept through all of it, but Frank got up to catch the sunrise colors and go to breakfast. Alex and I went down to breakfast late, which looked like it had been an assortment of scrambled eggs, French toast and bacon. We were both fairly cranky for some unknown reason, but that soon changed. After breakfast, there were more briefings and a fire drill for the Lindblad crew and an abandon ship drill for all the passengers. We had to wear our uncomfortable, boxy life jackets, which felt a lot like what I imagine the old-fashioned punishment of being placed in wooden stocks must have been like. It was over soon enough, and Larry, the Expedition Leader, explained the itinerary for the afternoon. In the afternoon, the groups got ready to head to the beach at Isla de San Francisco for snorkeling. Frank and Alex suited up in their wetsuits and joined the snorkeling party. They set off in one of the black rubber zodiac boats with about a dozen people on board, and stayed onboard. 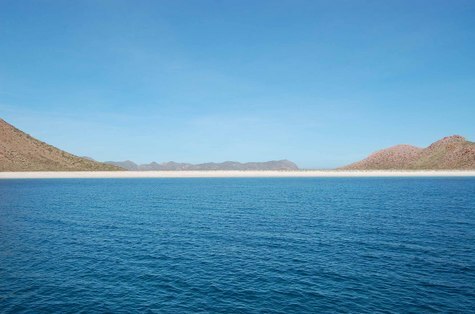 After a fairly uneventful flight, we landed at La Paz, Mexico, the capital of Baja. It’s a quiet beach town, with storefronts facing the beach where the National Geographic Sea Bird was docked. We arrived after a fairly uneventful flight from Los Angeles, where the biggest problem at both ends were long security lines. We were eager to get our Lindblad expedition underway. In 2005, we traveled on the Polaris with Lindblad to the Galapagos, and knew what to expect. When our shuttlebus arrived, they were not quite ready to receive us, so we left our belongings with the boat crew and walked along the lovely beachfront. Alex made a beeline for a nearby Burger King, which featured a huge playscape. I was able to order in Spanish, which means that "Yo Hablo Fast Food" fairly fluently. “Chicken Tenders” is evidently a universal term, so I did not have to dazzle the gal at the counter with my knowledge of the word “pollo”. Alex and I bought necklaces carved from coconut from a street vendor, and then we headed back to the boat to check into our cabin, a comfortable 3-person room with a tiny bathroom at the aft of the ship, right near the service stairs. Dinner was served after some briefings and introductions of the crew and staff of naturalists on board. There were margaritas and snacks served in the lounge, and we got the first chance to check out our fellow travelers, all 50 or so of them. The boat remained anchored at the dock overnight, due to some high winds, so we went to bed in our floating hotel in La Paz, Mexico. I plan to post pictures from this trip, but the wifi on board the boat won't let me. They may have to wait until we get home. I suppose I should be happy that we have an internet connection at all on this boat.